To Cite: Taghizadeh Kermani A, Vakili R, Dadkhah S, Jafarian A H, Bagheri R. HER-2/neu Overxpression in Esophageal Squamous Cell Carcinoma (ESCC) and Its Correlation with Patient’s Clinicopathological Features, Int J Cancer Manag. 2016 ; 9(5):e5007. doi: 10.17795/ijcp-5007. Background: HER-2/neu overexpression has been reported in various human cancers and identified as a significant predictor of poor survival. In this study HER-2/neu overexpression and its associations with clinicopathological characteristics were evaluated in patients with esophageal squamous cell carcinoma (ESCC). Methods: This cross-sectional study was performed on 64 patients with histological diagnosis of primary ESCC who underwent surgery for curative treatment. Immunohistochemistry (IHC) was used to assess expression of HER-2/neu receptor in formalin-fixed paraffin-embedded tissue blocks. Results: The mean age of patients was 60.1 ± 1.28 years. The overall HER2 expression was observed in 51.5% of ESCC patients without considering IHC scores. HER2/neu overexpression (6%) was significantly associated with the tumor differentiation (P < 0.001). 20.3% of cases were stage I, 67.2% stage II, and 12.5% stage III. 17 patients (26.2%) had vascular invasion, 12 patients (18.8%) had neuronal invasion and 7 patients (10.9%) had invasion to margins. Nine of 12 patients with HER-2/neu over expression had thoracic tumors and only three of them had an abdominal ESCC. Conclusions: No significant correlations were found between HER2/neu overexpression and gender, age, tumor invasion, location of tumor, TNM stages and stage of tumor in patients with ESCC. Esophageal cancer is the eighth common cancer in the world with over 400000 deaths reported in 2008 (1). China, the Caspian region of Iran, South Africa, and France are the high risk areas for the esophageal cancer in the world (2). Annually 6500 EC occur in Iran, of which 5800 patients die from EC (3). Squamous cell carcinoma (ESCC) is the most common histological type of esophageal cancer which presents in late stages and results in delayed diagnosis of this disease (4). However, several researches have been performed on esophageal cancer; still there is no appropriate marker for the early diagnosis of this cancer. The HER-2/neu (HER-2) located on chromosome 17 (17q12-q21.32) plays an important role in the growth of some cancer cells. HER-2 proto-oncogene encodes p185 HER-2 a transmembrane glycoprotein with tyrosine-specific kinase activity (5). Amplification and overexpression of HER-2 proto-oncogene has been frequently detected in approximately 30% of human ovarian, breast tumors and 26% of gastric cancers which is identified as a significant predictor of poor survival in these tumors (6). Previous researches have shown a dramatically effective application of adjuvant trastuzumab in HER-2-positive breast cancer patients which binds to HER-2 receptor and blocks receptor dimerization and facilities recognition of tumor cells by cytotoxic cells (7). According to Wang et al. study HER-2 proto-oncogene can be considered as an appropriate molecular marker in diagnosis and a new target in esophageal cancer clinical treatment (8). In Won et al. (9) study in patients with positive HER-2 simultaneous treatment with Trastuzumab and chemotherapy can be effective in controlling the disease. The potential benefit of trastuzumab therapy in the other tumors still has remained unknown. HER-2 positivity has been described with a very different rates in most of human tumors (10). It seems that HER-2-positive non-breast cancers respond to trastuzumab (6-10). In tumors with a poor prognosis such as esophageal cancer, using Herceptin® as additional treatment option would be helpful. Several studies demonstrated a relationship between HER-2 amplification/overexpression with these tumor entities (11). Immunohistochemistry and fluorescence in situ hybridization (FISH) routinely are used for determining HER-2/neu status, as protein overexpression and genomic amplification, respectively (12). 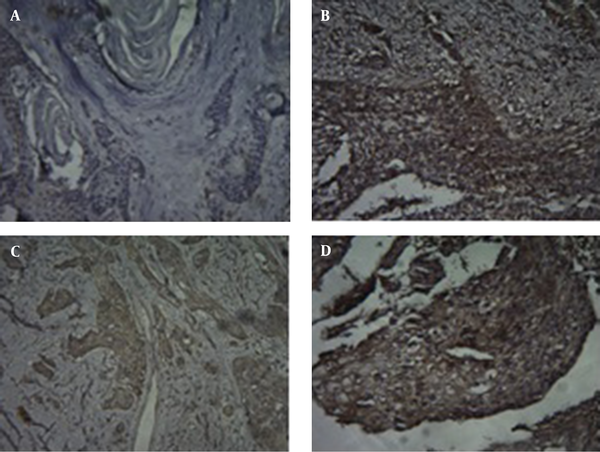 Therefore, in this study we evaluated the distribution of HER-2 expression in ESCC by immunohistochemistry (IHC) in order to assess the association between this receptor tumor content and clinicopathological characteristics. This cross-sectional study was carried out on 64 patients with primary ESCC who were histologically diagnosed and treated in the department of thoracic surgery, Qhaem University hospital, (Mashhad) Iran between 2009 and 2012. The study was approved by the research ethics committee of Mashhad University of Medical Sciences (MUMS, No: 891022). An informed consent was taken from each participant. Inclusion criteria were middle and lower esophageal SCC in patients who could tolerate the surgery. Exclusion criteria were upper esophageal SCC, other malignancies of esophagus and patients who received neoadjuvant chemo radiotherapy. Indeed all the patients who participated in the study were intending to undergo surgery and they did not request for other treatment modalities before surgery. All patients had undergone transthoracic esophagectomy with lymph node dissection in curative setting. Patients were classified based on the tumor node metastasis (TNM) classification. All patients had undergone staging procedures by thoraco-abdominopelvis CT scan before curative surgery. Table 1 shows the characteristics of patients. Abbreviations: ESCC, esophageal squamous cell carcinoma; T, tumor; N, node, the grade of tumor and stages were defined according to the UICC (TNM) classification. Immunohistochemical staining was carried out using the HercepTest™ (DaKoCytomation, Denmark) according to the manufacturer’s instructions. 4-μm-thick sections from tumor were obtained using archival, formalin-fixed, paraffin-embedded materials. Diaminobenzidine was used as a chromogen, and the sections were counterstained with hematoxylin. Non-cancerous esophageal tissues were used as a negative control and breast carcinoma served as a positive control sample. Two pathologists performed IHC analysis according to the staining intensity scores of the HercepTest™ kit. The intensity of HER2 staining according to Dako manual was graded as 0 (no staining), 1+ (weak and incomplete membrane staining in fewer than 10% of the tumor cells), 2+ (weak to moderate, complete membrane staining in > 10% of the tumor cells) and 3+ (strong, complete membrane staining in > 30% of the tumor cells). Samples scored as 2+ or 3+ were considered as “over-expression” (Figure 1). (a) esophageal squamous cell carcinoma (ESCC) specimen with HER2/neu IHC score of 0, (b) esophageal squamous cell carcinoma showing HER2/neu IHC1+ score (c), ESCC demonstrating HER2/neu IHC 2+ score (d), ESCC specimen with HER2/neu IHC score of 3. (Magnification × 100). Analyses were performed using the SPSS statistical software package for Windows (version 16.0, SPSS Inc., Chicago, IL, USA). Descriptive data were summarized as mean, standard Error and/or percent. Kruskal-Wallis test was used to examine correlation between tumor cell differentiation and HER-2/neu overexpression. We performed Chi-square test to analyze relationship between HER2 status, invasion and stage of tumor. Fisher’s exact test was used to determine associations between HER2 expression with tumor location and TNM scoring. A P value less than 0.05 was considered statistically significant. The study population consisted of 30 (46.8%) males and 34 (53.2%) females (male/female ratio 0.88). The mean age of patients was 60.1 ± 1.70 years (rang 29 - 81). The mean age of males and females were 60.80 ±1.70 years and 59.52 ± 1.97 years, respectively. Cases in stage I were 20.3%, stage II were 67.2% and stage III were 12.5%. Well differentiated tumors were 17 cases, (Grade 1), moderately-differentiated were 40 (Grade 2) and poorly-differentiated were 7 (Grade 3). Tumors located at the thoracic portion were 52 and tumors at the abdominal with a higher prevalence of T3 were 12. Vascular invasion was observed in 10.9% of men and 15.6% of women. Nerve invasion was observed in 9.4% of women and men. 6.2% of women and 4.7% of men had invaded surrounding tissues. HER-2/neu overexpression was observed in 18.75% of subjects (12 cases). The patients’ characteristics are summarized in Table 1. Table 2 shows relationship between clinicopathological features and HER-2/neu overexpressin in patients with ESCC. Abbreviations: N, number; Pos, positive; T, tumor; N, node. Esophageal cancer is one of the most common cancers in Iran with poor prognosis and advanced stage of disease at the time of diagnosis (13). Some reports suggest that abnormal activity of epidermal growth factor receptor kinase plays an important role in development and progression of esophageal squamous cell carcinoma. Activation of these receptors induces migration, cell proliferation and differentiation and overexpression of epithelial cells (14-16). However, understanding proliferation and overexpression of HER-2 proto-oncogene can help making appropriate therapeutic decisions. Very few studies have been performed to investigate association of ESCC and HER-2/neu overexpression. In this study, we evaluated overexpression of HER-2/neu using immunohistochemistry (IHC) to determine prognostic value of HER-2/neu overexpression and its associations with clinicopathological characteristics in patients with ESCC. In the present study, consistent with the previous reports, the mean age of patients was 60.1 ± 1.70 years and patients had the same age distribution (17, 18). There was no significant association between gender and age with HER2/neu overexpression in patients with ESCC which supports the results of previous studies (19, 20). In this study, overall HER2 expression in ESCC patients without considering IHC scores was (33 patients) 51.5% which seems to be high compared to previous reports (21-23). The reported rate of HER2 gene amplification vary from 6.5% - 30% (4, 24, 25). In a study performed by Wu et al. HER2/neu overexpression was 14.1% in patients with ESCC (26). In contrast, HER2 positivity in a study developed by Gonzaga et al. (18) was 21% in ESCC patients. In the current study, HER2/neu overexpression was observed in 4 patients (6%) (Score +3) of study population which is in line with some previously published reports (20, 27). This variation may be due to the differences in IHC staining methods, different criteria for evaluating HER2 expression and different incidence of ESCC around the world. Furthermore, compared to the results of previous studies, the present data indicated that HER2 positivity in ESCC was lower than gastric and breast cancers reported in previous studies (20, 28, 29). The degree of tumor invasion in the current study was investigated as vascular invasion, nerve invasion and invasion into surrounding tissues (17, 12, 7 patients, respectively). Among them, vascular invasion was the most frequent invasion. Similar to the result of Yukie Sato et al study, no correlation was observed between tumor invasion and HER2/neu overexpression in present study (4). However, in JUN XING et al. (20) study, HER2 gene amplification was correlated with the invasion of the ESCC cells. Therefore, further studies are required to provide more clarity regarding this issue. In this study, thoracic esophagus had the highest level of HER2 expression which could be expected due to the greater extent of thoracic esophagus and the high percentage of involvement in this region. Furthermore, in accordance with previous studies, HER-2/neu overexpression in the present study was not significantly associated with location of tumor (4, 6). The grade of tumor differentiation and TNM scoring are two important variables which might be correlated with the HER-2/neu overexpression in patients with ESCC. In this study, only 11% of tumors were poorly differentiated, instead 26% of them were well differentiated. However, most of the tumors were moderately differentiated which was similar to the some previous reports (23, 27). We found a significant negative correlation between overexpression of HER-2/neu and tumor differentiation which means HER-2/neu overexpression was more common in poorly differentiated ESCC (high grade tumors) versus other grades. A recent study also reported a significant correlation between the overexpression of HER2/neu and the differentiation of the esophageal squamous cell carcinoma (30). In contrast, Raziei et al. (6) found that well differentiated tumors overexpress the HER-2/neu protein in patients with gastric cancer. However, some other studies have not reported a significant correlation between tumor differentiation and HER2 gene amplification (19, 20). The reasons for these diversities are unclear. However, this discrepancy might be explained by the different methodologies used to evaluate and score HER2 with different cut-points staining by IHC. Another explanation is the different sample sizes and variation in the incidence of ESCC in different parts of the world with different demographic characteristics. Moreover, no correlation was found between HER2/neu overexpression and TNM stages, in the present study which is consistent with the results of Shan et al. study (31). In the current study, most of the tumors were in stage II and HER2/neu overexpression were not significantly correlated with the stage of tumor. Most of the previous studies also agree with our results and reported no correlation (4, 27, 32). In summary, we demonstrated that the overall HER2 expression in ESCC patients without considering IHC scores was 51.5%. HER2/neu overexpression (IHC 3+) was detected in 6% of ESCC patients. There was a significant negative correlation between HER2/neu overexpression and tumor differentiation which shows that HER2/neu overexpression was higher in poorly differentiated tumors compared to other grades. No significant correlations were found between HER2/neu overexpression and gender, age, tumor invasion, location of tumor, TNM stages and stage of tumor in patients with ESCC. Further studies with larger sample size are required to investigate HER-2/neu overexpression and associated clinicopathological features. Also we have to mention that patients who participated in the current study suffered from a special kind of esophageal cancer and this can indirectly affect the rate of HER-2 positivity; therefore, we suggest conducting more complementary studies. This paper is the result of student theses which is done in cardiothoracic surgery and transplant research center and supported and approved by deputy of research, Mashhad University of Medical Sciences. The authors would like to thank Mrs. Elham Lotfian for her kind assistance in preparing and revising the paper. Authors’ Contribution: Ali Taghizadeh kermani: manuscript revising, approving the paper, patient’s introduction; Rozita Vakili: manuscript revising and approving, data analysis; Samaneh Dadkhah: manuscript revising and approving; Amir Hossein Jafarian: manuscript revising and approving, patient introduction; Reza Bagheri: writing and revising and approving the manuscript, patient’s introduction.